The Jewish synagogue at left is the largest in Hungary, and also birthplace of Theodore Herzl. Our dear contact, Andras, is pictured with Kelly at left, as we prayer-walked this whole Jewish section of the city, crying out to God for salvation and protection of the Jewish people, and calling down the demonic principalities of anti-Semitism over this city. ​John and Kelly also taught and led prayer and worship in two Hungarian churches and one Messianic community, sowing seeds of the Restoration of all Israel. 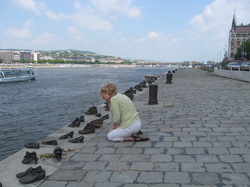 We also spent time at the very stirring memorial along the Danube River at the site where hundreds of Jews were murdered in December, 1945, their bodies tossed into the icy river. ​Kelly prayed to God to stand in the gap and intercede in repentance for the atrocities that took place here.